Recorded in the spellings of Aiton, Ayton and Hayton, this is a Northern English habitational name from any of various places called Ayton and Hayton in the counties of Cumberland, Yorkshire, Nottinghamshire, and elsewhere. It is derived from the Olde English pre 7th Century "heg - tunn", meaning "The hay Farm" or "eg - tun", the farm by the river. 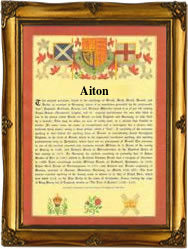 The first recording as a placename was that of Great Ayton in the year 881 in the chronicles of Yorkshire and in 1066 as the spelling of Etan, and then to Aton in 1279. The "modern" spelling is 16th century. Early examples of the surname recordings include Adam de Hayton of Nottingham in the 1202 Pipe Rolls of the county, Henry de Heiton in the subsidy rolls of Leicester in 1327 and Robert Hayton of Yorkshire in the Calendar of Inquistions for the year 1415, in the reign of the famous King Henry V. Later interesting recordings include the christening of Annas Aiton on April 9th 1581, at Holme, Cumberland, whilst on June 27th 1691, Averilla Ayton married William Croft at Gisburn, North Yorkshire. Illustrating the erratic nature of surname spelling even into (relatively) modern times, is the example William Hayton who was born at Topcliffe, Yorkshire on December 20th 1802. He is believed to be the same William Hayton, who is recorded as William Ayton, and who lived at West Tanfield, in North Yorkshire, where he adopted the spelling as Hayton. The first recorded spelling of the family name is shown to be that of William de Haitun, which was dated circa 1147 - 1154, in the "Charter Rolls of Yorkshire", during the reign of King Stephen, known as "Count of Blois", 1135 - 1154. Surnames became necessary when governments introduced personal taxation. In England this was known as Poll Tax. Throughout the centuries, surnames in every country have continued to "develop" often leading to astonishing variants of the original spelling.